Dice used as conjuring props is of decidedly more recent vintage with one of the earliest records being Hofzinser who used mis-spotted dice to force a number as early as 1842. However, the allure of these simple six-sided cubes has not escaped the attention of magicians in intervening years. 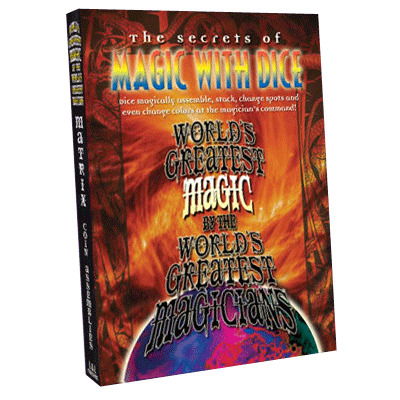 In this unprecedented collection, you'll find completely different approaches to conjuring with dice. John Mendoza begins by performing and then explaining Senator Crandall's classic dice stacking routine. Daryl is up next with a Chink-A-Chink routine that requires only four dice and a cup - a wonderfully visual assembly and no fifth die is required! Steve Dacri also offers a dice assembly routine (and if you don't know how it's done, it's a real fooler), while Mark Leveridge's Wild Dice is an eye-popping combination of the Three-Shell Game and the Cups and Balls. Daryl follows with the classic Sack's Dice Routine, and if you take the time to learn it, you'll never leave the house without a pair of dice. Finally, everything you always wanted to know about dice stacking is ably demonstrated and taught by James Zachary. In The Art of Dice Stacking, the video companion to his seminal book, Zack Stacks, you'll learn how to create a stack fourteen dice high, in addition to dice cup final loads, taking the stacks down one die at a time, and lots more. Dice are intriguing and romantic props that guarantee spectator interest, and these routines represent the best dice magic ever created.